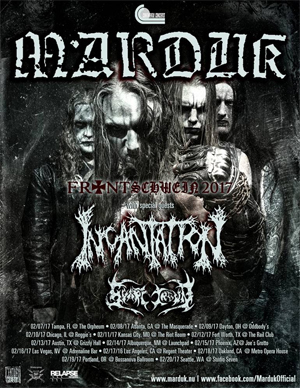 Legendary Swedish Black Metal band MARDUK just unveiled dates for the rescheduled North American leg of their "Frontschwein 2017" tour, which includes special guests INCANTATION and SVART CROWN (France). This run marks the first time that MARDUK has touched North American soil since the "Voices From The Dark" tour in 2013. MARDUK was forced to cancel the North American "Frontschwein 2016" tour due to visa issues this past Fall. Issues now resolved, the band is back and ready to treat fans to an unforgettable show filled with sinister classics of the MARDUK discography to the the war waging cuts from their latest release, Frontschwein. All dates for the "Frontschwein 2017" North American tour are listed below below.